Skin Essentials Gift Set: SPF Rx Daily Reparative Herbal Cleanser, Ultra-Clear Daily Skin Hydrator w/Broad Spectrum Mineral SPF 50, Dual C+E+Ferulic Anti-Oxidant Power Serum; 3-Piece Radiant Skin Set, Provides powerful antioxidant protection to prevent photodamage, age spots and collagen breakdown, while also moisturising and nourishing the skin with SPF 50 sun protection and protection from indoor lighting (HEV, LED, smartphone and computer/iPad screen radiation). A balancing cleanser to soothe and repair skin with healing Aloe, Arnica, and Chamomile. A unique blend of herbs, plant, and flower extracts to delicately cleanse, lightly exfoliate and balance the skin. The cleanser when massaged on the skin improves blood circulation, leaving the skin exquisitely cleansed and refreshed. Even skin tone by calming redness, soothing irritation and promoting general health and well being. This is an amazing moisturizer that also protects your skin from the damaging rays of the sun like a sunscreen. The only product of its kind with a technology called "Lipo-Shield"; which is a form of HEV protection. Ultra Clear carries the maximum FDA water resistant rating. It is a clinically proven fact that protecting your skin daily with an SPF of 50 or higher decreases the risk of skin cancer, and promotes healthier looking skin for longer. But no-one wants to put on a sunscreen over their moisturizer. No one wants a white sunscreen film on his or her face every day. Now you can get the protection you need, with the moisturizing nourishment your skin craves; and no white facial film. Plus! A Free SPF 15 Spearmint Lip Balm Made with 100% certified organic oils is included as an additional gift with purchase! Finally; the Future of Skincare is Here. Calm red, irritated skin. Hydrate dry rough skin and brings it back to a healthy, smooth feel. Like any nice moisturizer, it will leave no white film (unlike ANY mineral-based SPF-50 sunscreen you have ever tried!). Great Gift Set of Skincare for yourself, friend, loved one, employees or co-worker. Start with the Ultra Clear Daily Reparative Cleanser (8 oz) with 12 blended bionutrient herbs that reduce redness and irritation, help control oiliness and breakouts, while promoting healthy skin function. PLUS This set contains a Free Ultra Clear Travel Tube (12.5ml) and SPF15 Spearmint Lip Balm. 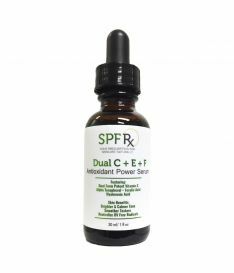 Follow with the SPF Rx Vitamin C +E +Ferulic Antioxidant Power Serum; the only Antioxidant Power Serum with 18 natural plant extracts and vitamins that provide nature's anti-oxidant skin protection plus natural moisturization, anti-inflammatories (reduce redness) and skin brightening (30 ml). 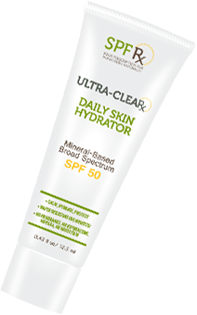 Finish with Ultra Clear Daily Skin Hydrator SPF 50 (50ml); the first daily moisturizing cream that also protects your skin outdoors with Broad Spectrum mineral SPF 50 sun protection (featuring natural zinc oxide), and indoors with Lipo-Shield HEV protection. It is also water resistant so it won't wash or sweat off when you are active. The result is HEALTHY NOURISHED SKIN THAT LOOKS BETTER DAY AFTER DAY. Deionized Water, Decyl Glucoside, Cocamidopropyl Hydroxysultaine, Sodium Lauroyl Sarcosinate, Cocamidopropyl Betaine , Sodium C14-16 Olefin Sulfonate, PEG-150 Stearate, Phenethyl alcohol, Caprylyl Glycol, Ethylhexyl Glycerin, Xanthan Gum, Peg-150 Pentaerythrityl Tetrastearate, Cocamide monoethanolamine, Aloe Barbadensis Leaf Juice, Glycerin (and) Water (and) Matricaria Recutita flower extract, Sodium Ascorbyl Phosphate, Panthenol, Argania Spinosa (Argan) Oil, Helianthus Annuus (Sunflower) Seed Oil (and) Vaccinium Macrocarpon (Cranberry) Fruit Extract (and) Punica Granatum Extract (and) Vaccinium Angustifolium (Blueberry) Extract (and) Fragaria Vesca (Strawberry) Fruit Extract (and) Actinidia Chinensis (Kiwi) E, Carthamus Tinctorius (safflower) seed oil (and) Calendula Officinalis Flower Extract (and) Sambucus Nigra Flower Extract (and) Glycyrrhiza Glabra (Licorice) Root Extract (and) Prunus Armeniaca, Curcuma Longa (Turmeric) Root Extract. Water, Aloe Barbadensis Leaf Juice, Sodium Ascorbyl Phosphate, Butylene Glycol, Tocopherol, Ascorbyl Glucoside, Propanediol, Methyl Gluceth 20, Glycerin, Glycereth 26, Phenoxyethanol, Benzoic Acid, Ethylhexylglycerin, Glycereth-2 Cocoate, Citric acid, Sodium Hyaluronate Acid Powder, Carrageenan (chondrus crispus), Xanthan Gum, Fragrance, Ferulic Acid, Arnica Montana Flower Extract, Chamomilla Recutita (Matricaria) Flower Extract, Cucumis Sativus (Cucumber) Fruit Extract, Sambucus Nigra Flower Extract, Glycyrrhiza Glabra (Licorice) Root Extract, Prunus Armeniaca (Apricot) Fruit Extract, Zingiber Officinale (GInger) Root Extract, Prunus Amygdalus Dulcis (Sweet Almond) Fruit Extract, Passiflora Incarnata Fruit Extract, Curcuma Longa (Turmeric) Root Extract, Camellia Sinensis Leaf Extract, Centella Asiatica Extract, Phyllanthus Emblica Extract, Ocimum Teniflora (Tulsi) Extract. SPF Rx Radiant Skin Products are ALL ANIMAL CRUELTY FREE. They are also Fragrance-free, Oxybenzone-free, Paba-free and like any nice moisturizer, the daily skin moisturizer, even though it is a mineral based SPF 50, will leave no white film (unlike ANY mineral based SPF-50 sunscreen you have ever tried!). Great Gift Set of Skincare for yourself, friend, loved one, employees or co-worker.